This article is brought to us by Eileen Blake, Marketing Manager of AlumniFinder. 1. Do NOT, under any circumstances, make it difficult to find your donate button! Let’s face it: sometimes people get lazy, and that’s especially true on the internet. We want to land on a page, find what we’re looking for, and take the action we came to take. There’s a very small amount of frustration we’re willing to put up with before we abandon one web page in favor of another. So, make sure that your donation button is clearly visible. Take the guesswork out of the equation so you get more donations. If you’re not sure if your button is visible, stand a few feet back from your monitor. Can you still see it? If not, make it jump out! 2. Do not limit yourself to one Tuesday a year. One of the key takeaways from this year’s #GivingTuesday Summit is that there are 52 Tuesdays in a year, so don’t just ask for donations on one of them. Set-up a reoccurring donation option so that if someone wants to they can give to your organization all year long. Monthly giving revenue you can rely on is a great way to achieve fundraising goals all year long. 3. Do not miss the opportunity to thank your donors. Recognition goes a long way toward not only showing appreciation for the gifts your nonprofit has been given, but also in encouraging others to donate to your cause as well. Studies have shown that people are more likely to give to an organization others are already donating to, so this is a way to simply amplify that effect. 4. Do not let your organization do all of the talking. While it’s great to get out there and be heard, when it comes to story-telling, it’s more powerful to include others. Let someone your nonprofit has helped share their story. Tell your supporters about the great ways people have contributed to your cause and the impact it’s making on their lives. Pencils of Promise, a nonprofit that builds schools around the world, has an incredibly impactful video designed to inspire donations. It tells the stories of their donors, including one who biked across the country to raise the money for building a school. Maybe someone hasn’t biked across the country, but how have your donors and volunteers supported you? Share the story to inspire others! 5. Do not miss out on #GivingTuesday! Every year, donations on #GivingTuesday have grown. In 2015, the increase was 145%! It’s a great opportunity for your organization to receive gifts, especially from new donors who plan their giving for this day. Make sure you are getting plans in place so you don’t miss the opportunity to receive donations! Planning for #GivingTuesday can seem intimidating if it’s new for your organization, but it’s really worthwhile to have a great strategy in place for one of the most important fundraising days of the year. If you need some help getting your plans in place, check out this resource to help you. 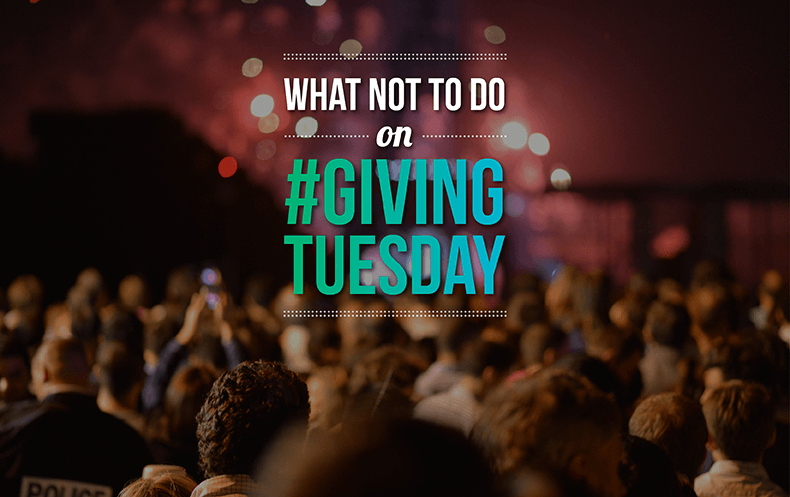 What are your biggest challenges for #GivingTuesday?